Adaline and Holmes Zeh were enumerated in the household of Webster D. Holcombe in the 1900 Richford, Tioga Co., NY federal census and listed as his grandparents. The census indicates that Adeline and Holmes were married approximately 1880; apparently Adeline (Gee) Holcombe remarried following the death of Milton Holcombe. [S741] Letter, Libbie Rice to copy in possession of Aggie Reynolds Lydia. Grover Holcombe was born circa 1891. He was the son of Joseph Romulus Holcombe and Rachael Elizabeth Dyer. Freedom Edgerton was born on 23 July 1783 at West Simsbury (now Canton), Hartford Co., CT.1 She married Timothy Holcombe, son of CT Holcombe. Samuel Wilkinson was born in 1650. He was the son of Lawrence Wilkinson and Suzanna Smith. Samuel Wilkinson married Plain Wichenden. Samuel Wilkinson died on 27 August 1727. There has been some diversity of opinion about the birth of Samuel. An article appeared in the June number, (1865) of the Heraldic Journal—published in Boston—entitled the "Wilkinson Family and Arms," by Hon. Theodore A. Neal, which states that Lawrance Wilkinson, "after having obtained special permission from Lord Fairfax, in 1652, went with his wife and son to New England." From this record it would appear that Samuel was born in England. No record of his birth is to be found in this country, and it is probable the above statement of Mr. Neal is correct, although there is some difficulty about it. Lawrance married Susannah, daughter of Christopher Smith of Providence, but we find no account of this marriage in the old records of Providence, neither do we find any account of Christopher Smith until after 1650. He appears in the list of Freemen in 1655. After a thorough and careful search of the first records kept by Roger Williams and the town clerks of his day, we find nothing to determine this matter positively, hence we are left to conjecture, that Christopher Smith came to Providence after Lawrance Wilkinson had established himself there. No record of Samuel's birth has been found anywhere, neither have we any data to determine it. The birth of his next younger sister, as given by Savage, occurred March 9, 1652. He was then in Providence. Samuel was a Justice of the Peace for many years in the infant Colony, and his house was a common resort for young people who desired his official services in the matter of matrimony. On one page of the public records are recorded thirty-one couple sic who were married by "Capt. Samuel Wilkinson, justice" and other pages show he did a thriving business in this line, and as in the days of Noah, so in his day in the town of Providence, "They were marrying and given in marriage." These facts show the confidence reposed in him by his fellow-citizens. He was elected Deputy for Providence to the General Court, as the Legislature for Rhode Island was then called, as early as 1693, and was returned from time to time during a period of twenty years down to 1723. [S182] Social Security Death Index (on-line), Ancestry.com, SSDI, Ancestry.com, SSAN 135-12-5591. [S182] Social Security Death Index (on-line), Ancestry.com, SSDI, Ancestry.com, SSAN 717-10-4901. Ponciano Longoria was born in 1852. He was the son of Juan Santiago Longoria. Ponciano Longoria died in 1914. [S182] Social Security Death Index (on-line), Ancestry.com, SSDI, Ancestry.com, SSAN 101-26-6762. Milton and Adaline were enumerated in the 1850 Richford, Tioga Co., NY, federal census. His age is illegible, but she is 27. Children in the household, all born in NY are Philena 14, Timothy 5, and Elizabeth, 2. Also enumerated in the household was Truman Ellis, age 15. Milton and “A.” were enumerated in the 1860 Richford federal census. He was 55, she was 37. Children in the household were Timothy 14, Elizabeth 12, Orange 1, Nathaniel 20, and Elnora 16. There is a Chas. Holcomb, age 18, living next door in the household of Stephen Hill as a farm laborer. Milton and Adaline were again enumerated in the 1870 Richford federal census. He was 65, she was 48. The only child in the household was Timothy M., 24. Also enumerated were Martha Gee, 70, Darius Gee 33, and Clara A. Gee, 12. Milton and Adaline were still in Richford for the 1880 federal census. He was 76, she was 52. Also in the household was Darius Gee 43, and Martha Gee 81. Timothy Holcombe was living nearby. [S370] The Strong Family Association of America Strong Update Vol 1, page 528. 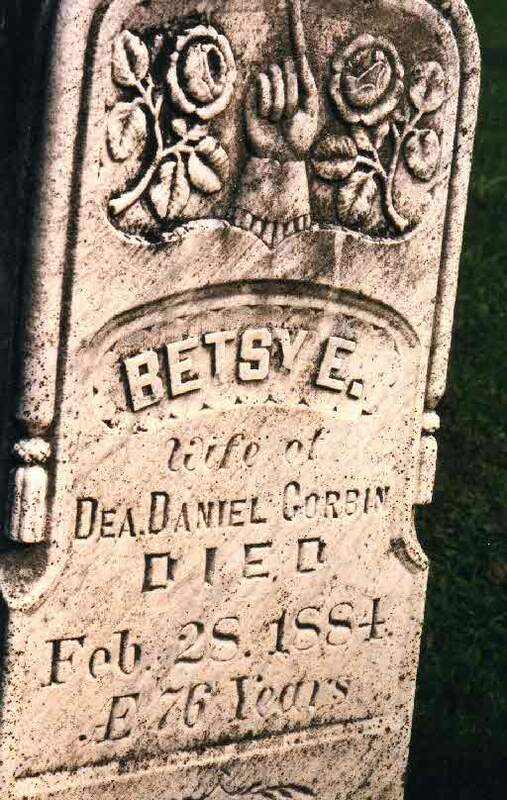 [S807] Find A Grave, online http://www.findagrave.com, memorial #99045735. [S807] Find A Grave, online http://www.findagrave.com, memorial # 131086171. Timothy and Hattie were enumerated in the 1880 Richford, Tioga Co., NY, federal census. He was a farmer age 33, she was 27. Children in the household were Elvie 6, Herbert 4, Daniel W. 3, and Mary E. 10 months. Violet Burtha Gage was also known as Bertha Gage.2 She was born on 26 September 1877 at Coudersport, Potter Co., PA.1 She married Herbert Holcombe, son of Chandler L. Holcombe and Lucy Morse, on 16 June 1902 at Olean, Cattaraugus Co., NY.1 Violet Burtha Gage died on 2 June 1953 at Potter Couinty Memorial Hospital, Coudersport, Potter Co., PA, at age 75. Nancy R. (?) married George Holcombe, son of Timothy Holcombe and Betsy Gatch, in 1835. Floyd and D. Irene "Froble" were enumerated in the 1930 Sweden, Potter Co., PA, federal census. He was an oil field laborer, age 31, she was 27. Children in the household were Ronald H. 9, Phillis D. 8, Virginia J. 5, and Agnes 3. Webster D. and Ada E. were enumerated in the 1900 Richford, Tioga Co., NY, federal census. He was a farmer age 22, she was 19. Also in the household were Holmes R. Zeh, age 71, grandfather; Adeline Zeh, grandmother, age 76, and Libbie M. Holcomb, sister, age 19. Webster and Ada C. were enumerated again in Richford in the 1910 federal census. He was a farmer age 32, she was 29. The only child in the household was Ruby, 9. Also in the household was brother Herbert, 34. On September 12, 1918, as Daniel Webster Holcomb, he registered for the draft in Tioga Co. His nearest relative was Ada Eliza Holcomb. Webster and Ada were enumerated in the 1920 Candor, Tioga Co., NY, federal census. He was 42, she was 38. Ruby was 18. Abraham Wilkinson was born in 1772. He was the son of John Wilkinson. Abraham Wilkinson died in 1816.